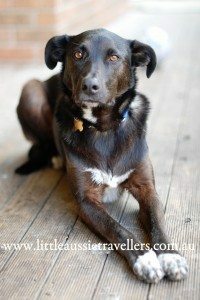 Travelling Australia With Pets, is it Possible? Travelling Australia is fun for all the family, and by that, we me ALL the family, pets included. Wondering if you can drag your dog, cat, bird or even other pets along on the journey? Why, yes! We believe you can, and here’s our quick guide to how. Is it Safe to Take Pets Travelling? We have experience with many kinds of pets. From snakes and lizards, to dogs, cats, rabbits, chickens, birds and even a pig! Would we take any of these travelling Australia with kids? Not all pets, but yes, for sure, some of them. After all, pets are part of the family aren’t they? Our dog goes almost everywhere with us, from short drives to the shops, to long, long road trips. How hard/easy or safe it is to take your pet travelling will depend greatly on the type of transport and accommodation you’ll be depending on. Travelling in a car and staying in hotels is going to be highly restrictive. Those travelling in buses, motor homes or caravans, and those self sufficient campers will have an easier time accommodating their pets. Travelling with Birds: Can be caged. Very tame birds could travel well, but for most birds, the journey may be too stressful. Travelling with birds will mostly require independent travel using a motorhome or van as most accommodation venues will not allow them. Travelling with Cats: Yes, we do know people who travel with cats. Mostly in buses, as it could be difficult any other way. If your cat is well travelled and you’re self sufficient and camping etc then you could definitely manage a feline friend on the road. Please keep in mind the safety of wildlife and don’t let cats roam free, or without bells on their collars! Travelling with Reptiles: Reptiles require special heating and this makes it difficult to have them as mobile pets. Not only this, licenses are required in most states, and their are strict rules on taking reptiles across state borders. These types of pets are best left at home. Travelling with other pets: It is possible to travel with other pets such as rabbits, guinea pigs etc. Keep in mind their individual requirements and if it may be stressful for the animals when being trasported. Where Can You Take Your Pets on Holiday In Australia? If you’re planning on heading to hotels, motels and caravan parks, then your options may just be a little limited when it comes to travelling with animals on board. If you’re looking to stay in these types of accommodation, the best option is to thoroughly pre-plan your trip and ring ahead in advance to ask individual managers/owners their pet policies. Don’t be surprised if it’s difficult. The great news is, the more self sufficient you are, the more pet friendly accommodation options you have. Hotels and motels generally don’t allow pets to stay, although there may be some exceptions to this rule. Much of it comes down to being a health and safety issue. If you’re travelling in a camper trailer, tent or caravan and planning on a camping holiday, then you may just be in luck. One of the most vital pieces of information is actually where you can’t take your pets when travelling. National parks and many reserves, sanctuaries or similar, do not allow domesticated animals. This is to protect native animals from disease, and from becoming too familiar with dogs etc which may put them at risk. Beaches, shops and restaurants will also have restrictions in place, and while this shouldn’t stop you taking pets, it’s definitely worth some careful planning to make sure that your pet friendly holiday is enjoyable for all the family. Finding Pet Sitters While Travelling. There may be times when travelling with your pet, you will need a short term carer. This is not as difficult as it seems. Most larger towns have pet boarding kennels, see our guide to choosing a good pet boarding kennel while on holidays. If that option isn’t available, then local vet clinics will often pet-sit for a small fee. If that’s sill not an option, then check with the tourist information centre for pet sitters, or ask around with other travellers, it’s not uncommon to find another travellers who is happy to pet sit for a few hours. No matter where you travel with your pet, as with any holiday, enjoy! I have been following your blog with great enthusiasm especially hoping to hear more about you’re experiences travelling with your dog. We spent 4 weeks in Tasmania in January and found it to be very dog friendly in general. We are self sufficient campers and enjoy nothing more than remote free camping which Tasmania is perfect for. We didn’t have our dogs with us this time round, but will be leaving on a year-long trip around Australia at the start of 2015 (2 adults and 2 boys, aged 6 and 8). Our dogs (2 staffies) will be coming too. Whilst we are under no illusions that they will restrict our options in some ways, there is no way we are leaving them behind. I would love to hear your thoughts so far. Whilst Tasmania was very pet friendly, I have found other states to be far less so. All the best with your journey, I am sure you are having a fantastic time!